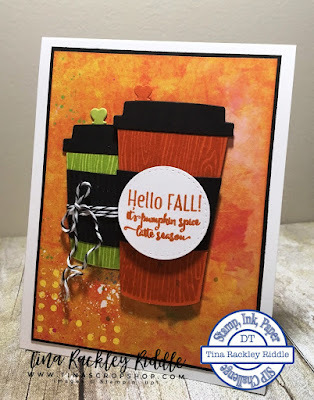 Tina's Crop Shop: SIP Challenge #120 - Color Challenge with Orange, Lime and Black! 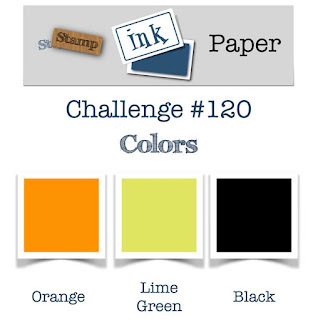 SIP Challenge #120 - Color Challenge with Orange, Lime and Black! Since it is Tuesday I'm over at Stamp, Ink, Paper again and this week we have a fun color challenge that screams Halloween or Fall! I don't make a ton of Halloween cards but I LOVE fall and my very favorite thing about it is Pumpkin anything! Yep, pumpkin muffins, pumpkin bread and of course.. Pumpkin Spice Lattes! 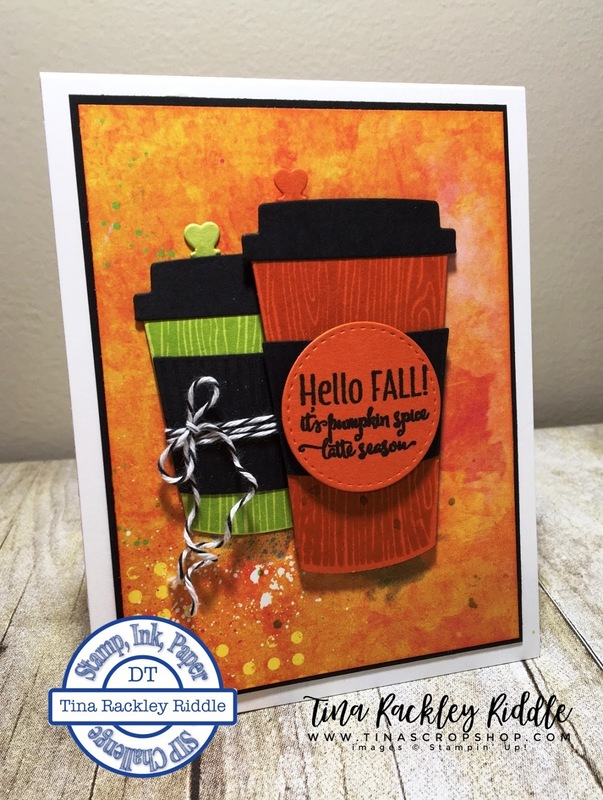 So you can probably guess where I went with this color challege.. straight to the Stampin Up! Coffee Cafe Bundle and the coordinating Merry Cafe Stamp Set. 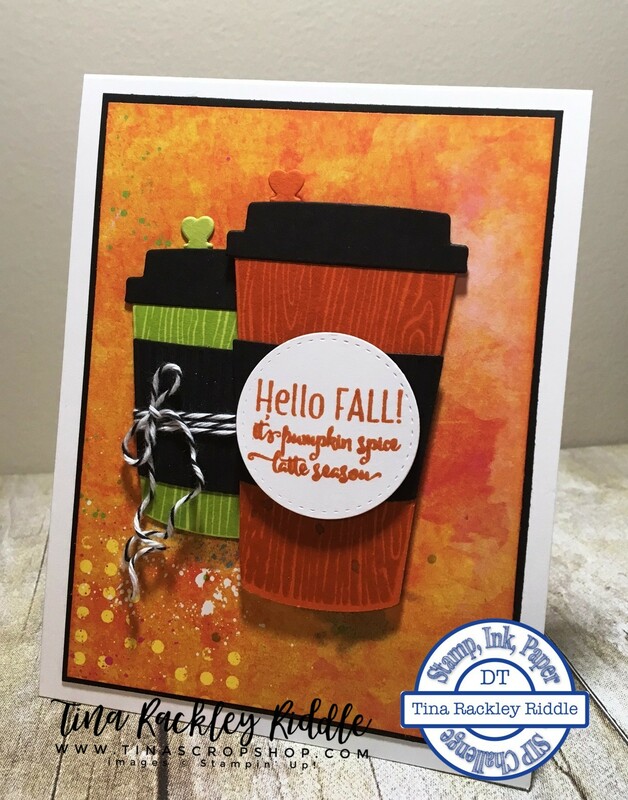 I ended up using both stamp sets because I had to have the sentiment from the Merry Cafe but loved the woodgrain cup from the Coffee Cafe. The problem with the woodgrain was that it only came in the smaller cup size and of course I always have a Venti with I get my PSL! Then I realized.. no biggie because the black sleeve will cover the seam so I stamped two woodgrain cups and combined them into one large cup... problem solved! I think it turned out super cute with this adorable distressed looking orange patterned paper from my stash. The paper even had a few splashes of lime green in it so that was a win. I ran some black and white baker's twine around the black sleeve of the lime green cup, using the side of my scissors to add some twirl in the twine. I adhered the lime green cup directly onto the patterned paper with Fast Fuse. The orange cup was adhered with foam squares. I love how the orange and black pop on top of the white! So much so that I remade the card with the circle over the coffee sleeve in white for another pop of white. So which one do you prefer? I seriously can't decide. I love each for different reasons! Thank background is amazing, Tina!